Kansas: Ad astra per aspera. Okay, I cheated. I was in Little Rock, Arkansas, on my way to Dallas, when I realized that I had to stretch a half-day's drive into two days. I allowed four days to get to Big D, and I was within 320 miles after only two days. Of course I had a big romp through Oklahoma planned. I was sitting in my room at the Best Western in North Little Rock when I remembered that the world's largest McDonald's is in Vinita, Oklahoma. I'm not really a McDonald's freak at all, but I saw it mentioned in a great road-trip book, American Quest by Jack Barth. I was wondering if I should go all the way up there. But then I saw the proximity of Vinita to the Oklahoma-Kansas state line, and I figured, "Bonus." The border is about 25 miles north of Vinita along OK-2, which multiplexes with US-59 at the town of Welch. The higway is a two-lane country road, and narrow at that, speed limit 65. The countryside here is rolling pastureland with cattle grazing away in the fields. On the airwaves are the broadcasts of community-owned radio stations. I was hoping that there would be a halfway decent sign here, as the nearest "border crossing" was about 15 miles away, and I didn't want to go too nuts with this. It's a very colorful sign with the yellow of the sunflower on a purple background. Also interesting is the assembly holding the sign up; it's not perpendicular like most normal signs, but in an added display of good humor it's at an angle of about 60 degrees. 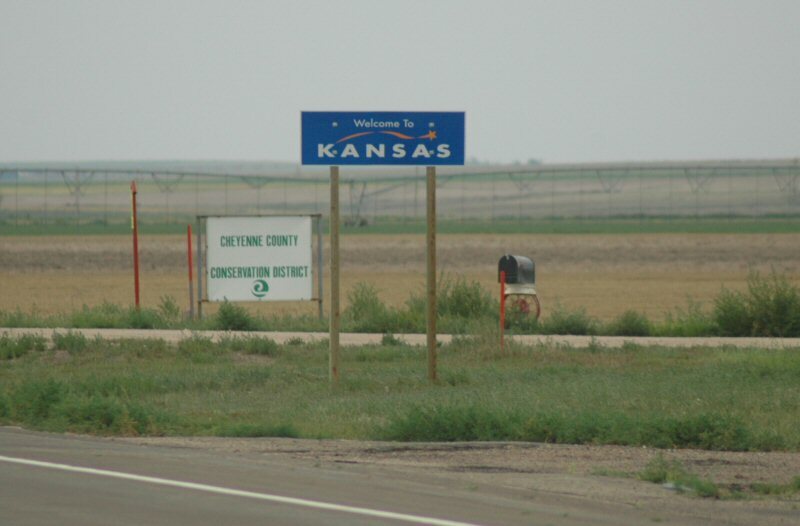 On the other side of the road there is a simple white-on-blue sign that reads, "Now Leaving Kansas. Come Back Soon." I say that I cheated because I drove a mile north on US-59 towards the town center in Chetopa before I turned around and came back. 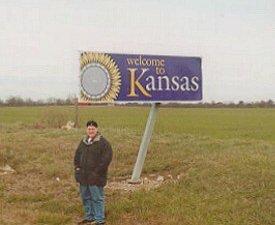 I don't know if it "counts," if I have "officially" been to Kansas, since I was there for about three minutes. But as long as I have my photo, it counts in my book. How could I have a two-week business trip to Kansas City, Missouri, be out there alone on the weekend with the rental car, and not advance the quest? I couldn't. So on that Saturday, I gassed up my rental Chevy Lumina and headed west on I-70 towards the capitol of the 34th state. 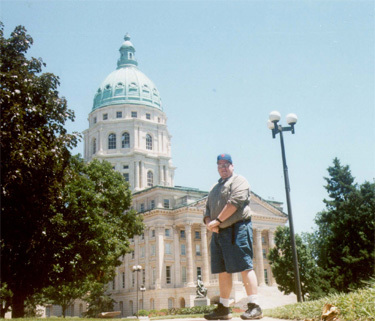 After navigating through some tight turns and construction zones, I was at the steps of the statehouse. Topeka struck me as a really sleepy town as I arrived just after noon on a Saturday. That said, the Kansas State Capitol is quite a stark presence, expecially when set in front of a very high Kansas sky. Built in 1903, it is 304 feet high, taller than the dome in Washington, D.C. In an unusual move, the cupola is made of copper. When copper oxidizes it turns a light aqua green, just like the Statue of Liberty. Also on the grounds was a statue of President Lincoln (R-Illinois). These are quite frequent; there are statues of the Great Emancipator in Charleston, Lincoln (of course), and I assume in Springfield as well. Kansas had an interesting beginning. To put it in the right historical context in the Antebellum United States, the big issue of the day was whether the new states that were being created were going to be slave states or free states. So before the first territorial legislative election, about 5,000 rowdy Missourians, forever known as the Border Ruffians, invaded the Kansas Territory, and in a move that would have done Bill Daley proud, rigged the election to force a pro-slavery legislature. The number of votes exceeded the number of voters. In 1854, President Pierce (D-New Hampshire) signed the Kansas-Nebraska Act, which left the question up to the settlers. Soon after, pro- and anti-slavery posses (one of which was led by John Brown of Harpers Ferry fame) began to appear on the scene. Many hundreds were killed in skirmishes between 1857 and 1861 by groups crossing over the Kansas-Missouri line, sacking towns along the way. It wasn't all blood and guts though. Kansas, of course, gave us Dorothy and Toto. Kansas also gave us President Eisenhower of Abilene. In fact, work by the Society for American Baseball Research (of which I am a member) reveals that as a boy, Dwight D. Eisenhower may have been a centerfielder for a semipro team in his hometown of Abilene in 1910. If this is true, it is possible the Allies may have lost World War II. That is because Ike went, of course, to the U.S. Military Academy. West Point required all new cadets to sign a pledge stipulating that they had never played sports for money to determine their athletic eligibility (and Ike did play baseball and football for the Cadets, and in fact tore up his knee in a football game in 1912 which ended his sports, and nearly his military, career). Playing a few semipro games would permanently cost an athlete his amateur status, as Jim Thorpe would soon learn. If Eisenhower did play semipro ball (under the assumed name of Affie Wilson), that would have meant that he lied on his athletic eligibity pledge and risked getting expelled from West Point. Eisenhower told Giants great Mel Ott something about the Kansas State League but never categorically confirmed or denied the claim. This page loaded in 1.908 milliseconds.